It so happens to work on any spell with targets. Honestly, the fizzle rule itself needs re-examination from the ground-up, but I will grant that any change to it will impact the game significantly. I like the idea, but I'm worried it's too narrow, is fizzling that much more of a problem on non-totem-armour auras? If you cast ghost path on a creature, and someone can kill it in response, does it ever normally make a difference that they wait until it's resolved and then kill the creature? It does when the aura grants a toughness bonus. 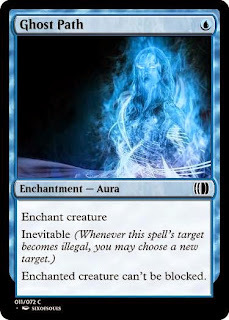 Good point that there's no reason to put inevitable on an aura that doesn't make its target more resilient somehow, or else grants some kind of LTB trigger. I like it. And I might be writing a blog post about targeting / fizzling rules in the near future. A thesis, for discussion: Nothing in Magic breaks if you abandon the fizzle rule. You just switch to the "Do as much as you can but nothing for illegal targets" rule that governs multiple-target spells anyway. Stuff like Beast Within gets marginally stronger, but I'm not aware of any effect that breaks entirely under these circumstances. For Auras, what this would mean is that the Aura enters the battlefield and gets sacrificed immediately as a state-based action (along the lines of Evoke). Seems like Gifts Ungiven would get pretty bonkers (if you could somehow give your opponent shroud in response), and in Vintage, being able to fizzle Oath of Druids mid-resolution is not irrelevant. Granting shroud/hexproof to *opponents* takes some work. Bazaar Trader on an Aegis of the Gods or some such. If Zedruu wants to use a 3-card card-disadvantage combo to tutor for 4 cards, that doesn't seem too overpowered compared with Insidious Dreams or Diabolic Revelation. A few things change in power level, yes. But I think I agree with lpaulsen that nothing much breaks. How do you interrupt a spell mid-resolution? Totally fine with Gifts Ungiven breaking if you can give your opponent shroud. I'm all for abandoning the fizzle rule. He means fizzling the Oath of Druids triggered ability (whose targeting condition is "target player who controls more creatures than he or she does and is his or her opponent") by saccing/bouncing your creatures in order to reach parity before the Oath ability resolves. I'm totally in favor of abandoning the fizzle rule, and if something breaks, ban it. Magic is 20 years old, but it has a long future, I think the game benefits from making the right choice, even if it costly. And it just gets costlier. As to Inevitable, that is an enormous amount of text for something that basically never matters. Also, for something obviously aimed at new players, how many new players will understand what it means when they read it? 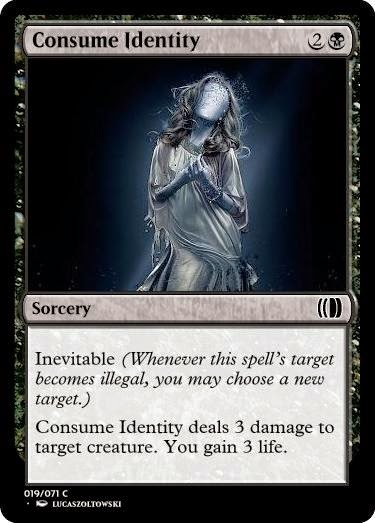 Worse, I don't think you can get away without saying "target becomes illegal while it is on the stack" because if my Aura is on a creature that suddenly gets protection from enchantments Inevitability shouldn't do anything. So, though I think this is untenable as a keyword, I do think this would make a neat Mythic Rare... something like "Whenever an opponent casts a spell or activates an ability that is not a mana ability, you may change the targets of any spells or abilities you control on the stack." 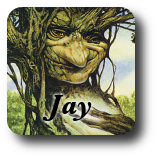 Oath or Druids is a terrible design. Or at least a terrible template. Inevitable is just over two lines. I agree that's more text than the ability is worth, but I'd hardly call it enormous. What makes you say it's aimed at new players? I agree it won't be obvious to new players. This wording does require players to know that aura target while they're spells but stop targeting once they resolve, and that's not entirely self-evident, yeah. Your conclusion makes sense. I'd rather change the fizzle rule. I think that once players know/learn the rule about why an enchanted creature gaining shroud doesn't have any effect on the Aura, they can figure out that inevitable only works on the stack without having to spell it out. FYI, Alex, I'm a "she." Also, I just Gathered Insidious Dreams. Am I misreading something or is that card terrible? Insidious Dreams does seem terrible. How does it have four stars? Oops! My apologies, Jenesis. I realised right after I posted I'd made an unwarranted assumption there. But Insidious Dreams? Suppose you're a Johnny (the kind of player who most likes tutors). You've built a deck around a 3-card combo. Your deck would be 12 cards plus lands if it could, but you need to get it up to 60. Insidious Dreams is the most reliable, fastest way to ensure you get all three parts of your combo. It's much less mana-demanding than Planar Portal, or even Demonic Collusion. You don't care that you have to discard 3 cards: If you're discarding them then they're not cards in your 3-card combo. Plus it was also printed in a graveyard set, where discarding was rather less of a drawback than it seemed if you discarded Ichorid to hit Threshold. But the whole Dreams double-cycle share that aspect, and I'm willing to guess some of the others probably have a rather poorer Gatherer rating, so that's going to be a rather more minor aspect. I agree with Tommy Occhipinti that this will almost never matter. 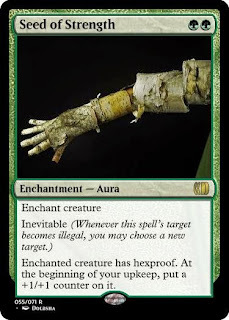 I could see a one-off cycle with this ability, perhaps, but not a keyword ability except in a pretty unusual set. The ability reminds me of another cycle a friend created a couple of years back, as exemplified by Appropriate Harm: "Choose two target creatures. Appropriate Harm deals 5 damage to one of them." I think Split Second does this effect better, does it not? In all cases that don't involve morph, that is.